I keep meaning to skip a week or two of Sew Weekly Challenges and give myself a break, but lately, they are just too good to pass up! This week was "Polka Dots," and I could not, in good conscience, let that one pass me by. Turns out, the only fabric with polka dots left in my stash (other than scraps – there are plenty of them) was this quilting cotton, leftover from an apron I gave as Christmas gift. I had forgotten all about the original project until the lady with the apron, whom I see everyday at work, recognized the print (she had used the apron a few days prior)! We had a good chuckle over that! 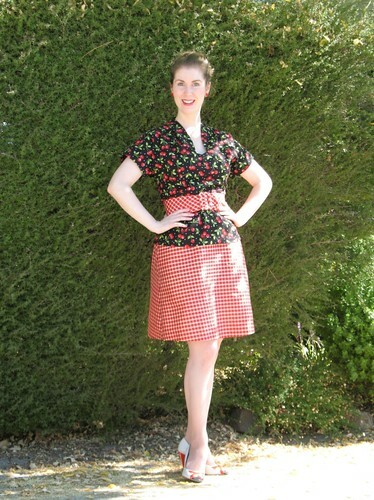 Now, I really do love the print (which is perfect for an cheery apron! ), but it would be 100 times more beautiful if it were made of silk or rayon, am I right?! 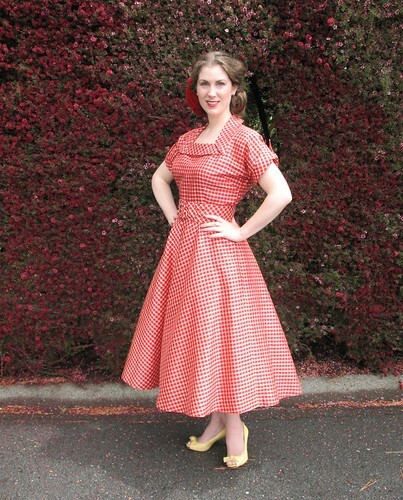 I have used this particular pattern before (Simplicity 4047), so I knew what to expect. And everything went together beautifully. I love my silks and rayons to death, but cutting a quilting cotton is SO EASY after working with drapey material! And, of course, I had to use my cherry red Hug Snug seam binding. I may be obsessed with my seam finishes, but they make me happy. Then there is always the issue of what to wear with my new garment. . . Turns out, I had the perfect skirt and belt, from two separate projects. I just love when everything comes together like that! 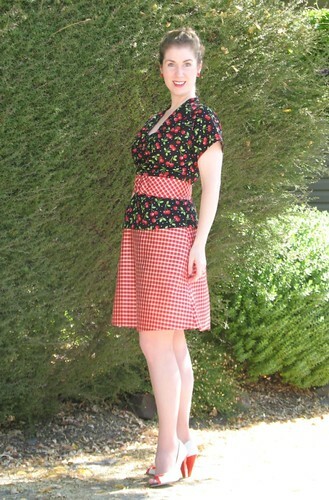 Cherries + gingham equals massive cheerfulness and darling, beautiful style. Beautiful! Excellent pairing with the gingham. I also see that top carrying in to fall with a wool pencil skirt. "Ya get the feeling she'll be modifying the Cambie into her golden years?" "Mmmm hmmmm. It's foolproof, at least for the wearer. As for aging, obviously this one's got the goods on Father Time." "The only way we'll know when she gets a face lift will be Hug-Snug around her hairline." "In the meantime, she no sooner posts than HE praises her every doing." "Yep. If he isn't mentioning her on his blog, he's all over the Internet echoing her ovations." "So the sewmance continues, does it?" "I'll say. That was no highland fling." "Our California seamer is determined to create the sewing world's first power couple." "Are they [pause] keeping company?" "Did you notice how easily she ensnared him?" "Pffft, her hooks are barbed, and her tentacles are forked. [nasally exhales cigarette smoke] So what else is new?" [with mock inquisitiveness] "What about her claws???" "Calloused - from the helpless writhing of her previous prey; in Latin, 'manus unsuspectingus'." "And now she's all ensconced in some mix-n-match get-up to belie her every move and motive." "To anyone else's man, this one offers 50 shades of astray."